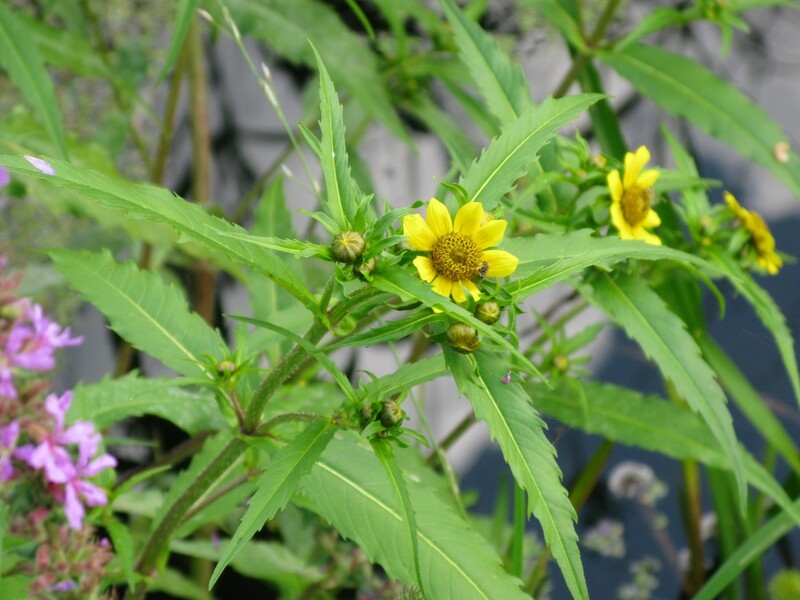 Bidens cernua is an annual herb 10-100 cm tall. Leaves opposite, narrowly lance-shaped, stalkless, often fused across base, blade 4-20 cm long, 0.5-4.5 cm wide, margin usually toothed. Flowers yellow, ray flowers 0 or 8, (when present), disk 1.2-2.5 cm wide, usually nodding, papery bracts among disk flowers yellowish; basal bracts leafy, spreading, longer than disk, blooming and fruiting Aug.-Oct.
Fruit dry 1-seeded, 0.5-0.8 cm with thick, pale margins, topped by 4 barbed awns. Habitat: Wet soil, pH 5.1-7, moderately shade tolerant (USDA 2006).